Takahashi FSQ-106ED @ f/5.0 (530 mm F.L.) Captured at 2.1 arcsec/pixel. Shown at 2.93 and 9.39 arcsec/pixel. 4/18/2017 to 4/29/2017 Chino Valley, AZ with CCD Commander & CCDSoft. RGB 600 min. (20 x 10 min. each) "
eXcalibrator v5.0 for (g:r) color balancing, using 136 stars from the APASS database. As an intermediate spiral galaxy, IC 2574 is in between the classifications of a barred spiral galaxy and an unbarred spiral galaxy. It is designated as SABm in the galaxy classification scheme. These galaxies usually have a single spiral arm, and are named after their prototype, the Large Magellanic Cloud. 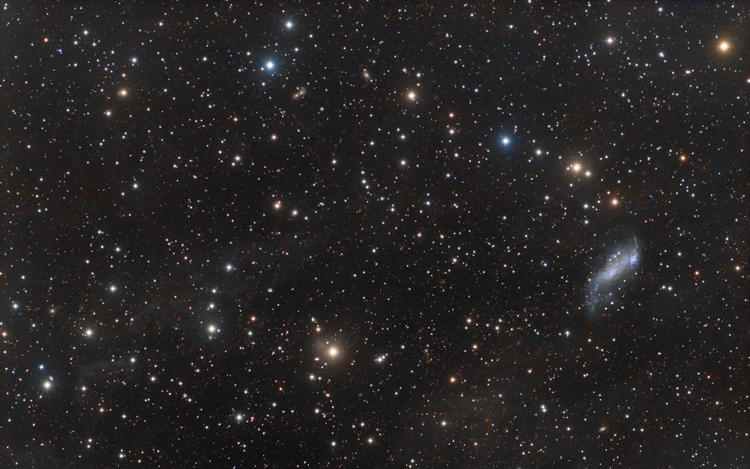 IC 2574 clearly appears to have two arms. IC 2574 is about 12 million light-years away, in the constellation Ursa Major, and is a member of the M81 group. Edwin Coddington discovered the galaxy in 1898. At that time, it was thought to be a nebula. The image also shows the Integrated Flux Nebula. This feature, of our galaxy, is faint dust illuminated by the general galactic starlight.